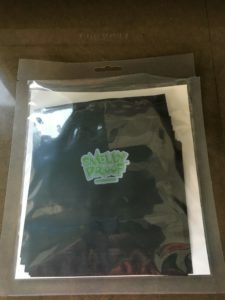 Smelly Proof bags are resealable, reusable plastic storage bags. They are made from a medical grade material that is FDA and USDA approved. There are a lot of sizes. 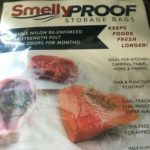 I tried a few with just food but I hear smelly gym gear aren’t a match for these bags. I used hot dogs and cheese and let them sit a few days in a few of the different sized bags. While they were sitting in my refrigerator there was no residual smell. None, it’s amazing. The food stayed fresh. When I opened the hot dog bag the smell seemed ten times worse because the bag contains all of it. The seal is tight. Way tighter than anything I’ve ever used. 2” by 3”, 6” by 4”, 7.5” by 6.5”, all the way to our oven bags, which measure 23” by 18”. These bags are available in boxes of 10, 25, and for the extra small bags, even quantities of 100. This product is a dream. I can’t say how many uses you’ll get out of these bags, but they’re puncture proof and moisture repellant.